Catastrophe bond issuance for 2017 now stands at $10.15 billion, according to data from the Artemis Deal Directory, the first time the cat bond market has ever seen a double-digit total and with almost six months left to run this year is set to eclipse all previous market records. The catastrophe bond market has been aiming for the magical $10 billion of issuance for a decade or more, with 2007 the first time that the market passed $8 billion in a single year, then once the capital markets recovered from the financial crisis growth returned. It’s taken all this time for us to get to the $10 billion mark, but in 2017 we’ve managed it in hurry, with us only just over half way through the year and plenty of time to add to the tally to make 2017 the biggest year for the cat bond market by a big margin. The second quarter of 2017’s record $7 billion of issuance, following on from a record Q1 as well, is the reason for this new record, as sponsors and investors matched the most securitized insurance risk and capital we’ve seen in a single quarter since the cat bond market’s inception. The closing and settlement today of the ground-breaking $320 million issuance of pandemic catastrophe bonds by the World Bank, through the International Bank for Reconstruction and Development issued IBRD CAR 111-112 capital at risk notes, to provide the majority of the backing for the Pandemic Emergency Financing Facility (PEF), is a fitting way to reach this $10 billion milestone. More on that deal and the PEF backing here. 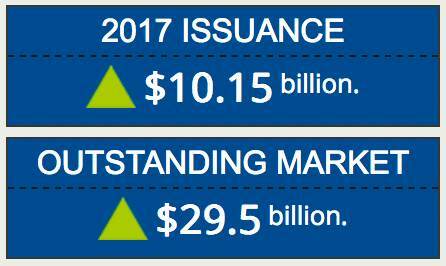 Despite a couple of maturing cat bonds, the outstanding market has also increased slightly in size today, reaching just shy of $29.5 billion, a new high and putting $30 billion just a few issuances away. Less than 1 week until our ILS Asia 2017 conference, get your ticket.